Astrophotographer Giuseppe Petricca took this image on May 30, 2014 from Pisa, Italy. This stunning image of Mercury, the moon and Jupiter also showcases a historical landmark of the Italian city from which it was taken: the Leaning Tower of Pisa. 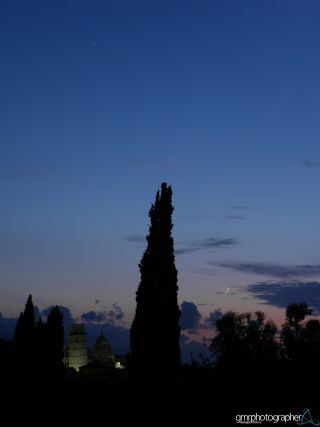 Astrophotographer Giuseppe Petricca took this image on May 30 from Pisa, Italy. Petricca said he waited for the wide encounter between the three celestial objects. Mercury appears at the right of the image, while Jupiter shines from high above. The crescent moon was just 5-percent illuminated and two days past new phase when it passed Mercury and Jupiter as it waxed across the sky on May 30. Mercury arrived at its greatest eastern elongation, or its greatest angular distance to the east of the sun in the sky, on May 25 and has since started approaching the sun beginning to fade noticeably. Petricca captured this photo using a Nikon P90 camera on tripod, ISO 100, f3.5, with 1.6" exposure.